The eleven rudras can be classified into those in which energy manifests and those in which mass manifests and those in which both energy and mass manifests. Of these eleven we saw five rudras are color coded, in the last blog. They are Electro-weak-strong force-field (VirupAksha/White, iSAna/colorless), Electro-weak force-field (vilohita/Red), Weak force (nilalohita/purple), Electromagnetic force(pingala/yellow) and Strong force (shambhu/Cyan). These five rudras that are color coded are described in Pancha Brahma Upanishad and Mantras. Brahma is expanded spacetime. The color coded Pancha rudras (five force-fields) in the Brahma (the expanded spacetime) give rise to life and death of matter/beings. Hence these five rudras or force-fields are exalted as the utmost important pancha rudras in the pancha brahma mantras. The Pancha-Brahma mantras are in Taittiriya Aranyaka (X.17-21) of the Krsna Yajurveda. The tenth chapter is called the Mahanarayan Upanishad. Therefore, these mantras can also be said to belong to the Mahanarayana Upanishad. These five rudras or force-fields do the five functions in the Universe. The five faces or forms of Shiva represent the five functions or acts (pancha krityas) – creation, sustenance, dissolution, concealing grace and revealing grace.. Creation of matter and life forms is done by Electromagnetic field. This is Sadyo-jAta. Life and matter forms are ‘carpented/chiselled’ out of existing matter forms when they get subjected to Electromagnetic force field. Hence it is also called Twashta. All matter forms are decayed and dissolved by Weak force. This is dissolution. This is Aghora. Tatpurusha is a compound of two different independent nouns. Life-giving Electromagnetic and decaying weak force are compounded into an Electro-weak force. This Electro-weak force conceals both Life and death giving force-fields in it. This is the ‘concealing’ grace talked about in Tat-purusha. Isana is combination of Electromagnetic-weak-strong force field (Unified field). When these forces split up and interact with force-fields of matter (Dirac-fermi fields), it becomes the controller of all matter and life-forms. This is the ‘revealing’ grace. ‘Gayatri’ mantras have a particular format and repeat the same format for all divinities. ‘Vid’ is knowing or knowledge. Vidmahe is the great knowledge or some thing that is great to have knowledge of. ‘Dhi’ is ‘thought’. Dhimahi are great thoughts that discover great knowledge. ‘Coda’ is whip/goad that drives animals. Pracodayat is self-driving, self-inspiring. We discover great knowledge (vidmahe) through great thoughts (dhimahi). This is the process of ‘self-inspiring’ or ‘self-driving’ (pracodayat). Knowledge is gross, sthula, the subject to be uncovered. Hence vidmahe. Thought is feminine, an internal property and hence dhimahi. How do we uncover knowledge of great things..? With great thoughts. This process is pracodayat a self-inspiring, self-driving process. Hence the ‘mantras’ that sings (gaya) about these three, great knowledge, great thoughts and self-inspiring are called gayatri. All Gayatri mantras talk about some knowledge that has to be un-covered and tell us what we need to think about to discover that knowledge and be self-inspired about it. The case in point is Rudra-Gayatri which talks about uncovering the knowledge about TatPurusha, the Electro-weak force. iSana is the combination of Electro-weak-strong force field. Virupa-aksha Rudra is of the form when Electro-weak-strong force originates as a single force. This unified force-field splits into the three components over a period. These three force-fields interact with dirac-fermi fields (bhava Rudra or Tryambaka rudra which we will see later), originate matter and beings that evolve. These become the controller of all matter and beings in the Universe. That controller form is iSAna. virupa-aksha is White in color as it is the combination of three force-fields, while iSAna is colorless after the force-field has split into three. Since Unified field is from which the Electro-weak, Weak, Strong, Electromagnetic force field descends, it is placed on top of the four force-fields (faces). This Unified field is the 'umanifested ether' because it never manifests as it is. It is beyond the vibrations (svaras) of Electromagnetic field, Weak field and strong force-field that manifest in the universe. Intelligence evolution in the Universe is based on electromagnetic field. Electromagnetic field is part of the core (sa-akshin) Electro-weak-strong force (iSAna) field. Sa-Aksin, the one that is part of the core becomes the witness to others in the core. Hence sAksin becomes witness. Since 'aksi' was later translated as 'eyes', witness became 'eye-witness'. In the Pancha Brahma Upanishad, isAna Electro-weak-strong force-field) is described as the Supreme Ruler and the witness of the intelligence. Pancha Brahma Upanishad says, "matter (devas) do not realize this Unified field (as it gets split by the time matter dawns in the Universe) in that Unified form. This iSAna is the supreme 'abode' of all the force-fields." It further says "The five (force-fields/rudras) are, as it were, the division of one Brahman. Thus understanding the one as five he reaches Isana (the fifth).". Thus iSAna is the one force-field from which all other four derive. Pancha Brahma Upanishad describes ISana as the Unified field above/beyond all the matter (devas) and above all svaras (vibrations of the universal matter). The svaras (vibrations) of universal matter are in Electro-magnetic force-fields or weak force-fields or strong force-fields. Isana’s vibrations happened in the past and thus above/beyond the existing svaras/vibrations of force-fields. The Upanishad also describes Isana, the unified Electro-weak-strong force-field as the cause of the pancha krityas (five functions) in the great form of the five Brahma rudras. Isana is from which everything learns (is the knowledge of all other force-fields) (isanam sarva vidyanam). iSAna rudra (the Electromagnetic, strong, weak force) is the knowledge of all the matter and beings in the Universe. Only those that learn these manifest as matter in the Universe. Isva are arrows. Isvara is the force-field of arrows that pierces all the matter. Isvara is the Weak force that decays all the matter (sarva bhutanam) in the Universe. Isana has the arrows (weak force) that pierces all the matter. 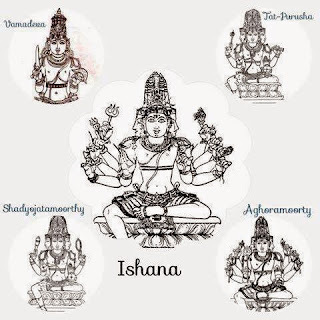 Isana is the lord (adipati) of the expanded spacetime (brahma) and its expansion (brahman). Spacetime expands. The expansion of spacetime is lorded over by Isana. In the Quitessence model, as kinetic energy of dark energy field moves more and more into EM, strong force and weak force-fields , potential energy of these fields increase, kinetic energy of dark energy field decreases, which creates a negative pressure that expands the space time. This described in my previous blog-posts. Isana (Electro-weak-strong force field) is how energy (siva) manifests (astu) in spacetime (brahma), he (sah) certainly (eva) is the one always in the form of energy (sadA-siva) in the AUM. Tatpurusha (a compound of two indepenndent nouns) is a ‘compound’ of Electromagnetic and weak forces. It is the Electroweak force. Electro-weak force is vilohita and deep red in color. In modern ‘Lagrangian’ physics, where motion of a system is described in terms of its energies, more precisely as difference between its kinetic energies and potential energies, the Electro-weak force’s motion can be said to have ‘eight’ parts, after Higgs boson acquires a vacuum expectation value. These eight parts capture all parts of electro-weak interaction, the way energies in the field are distributed over its interactions with other field (Fermions, fermions-electric charges, fermions-weak isospin, Higgs, Higgs-gauge vector interactions, gauge three point, four point interactions, fermions-Higgs) and thus describe its state of motion. The components of this Lagrangian equation part of these eight parts, when put together could expand to fifty or a number closer to that (which I am not sure). Post symmetry breaking, five force-fields viz., Electromagnetic, weak, fermi, strong and Higgs field gets established in their current form. All the ‘Ganas’ of sets of force-field interactions which build on each other forming particles, atoms, elements, compounds are led by the breaking of this force-field. Hence this force-field is the ‘cause’ of creation (of matter and living beings), preservation (building of more and more complex beings) and destruction (annihilation and decay of matter). This field existed before/beyond the electromagnetic field that we perceive now, that plays a role in our consciousness. This force-field impacted Spacetime, Higgs and a lot of other force-field as could be seen its eight part equations at that time. The above explanation can be only understood if we have the understanding of how electroweak interaction happens and in no other way. When it cannot be explained, it gets into ‘spiritual’ mode where people start creating their own explanations and philosophies. How do we uncover the knowledge about Tatpurusha, the Electro-weak force..? The mantra says think about Mahadeva. Mahadeva is the Electromagnetic field. It is through thinking, analyzing and understanding mahadeva, the electromagnetic force (which is the visible/perceivable force unlike the weak force), that we can get to know about Tatpurusha the Electro-weak force. It is absolutely true. This is how the world indeed propounded the Electro-weak force theory. Sadyo-jAta means that is just born. It is used to indicate a just born calf. The just born force-field is the Electromagnetic field in the Standard Model. Pancha-brahma upanishad says Sadyojata represents Earth, Pusha (the sun), Lakshmi, Brahma, Trivritsvara (sound), Rig Veda, Garhapatya fire, the mantras which have seven notes, yellow color, and Kriyasakti. Obviously Electromagnetic force-field in earth is Yellow in color (Pingala Rudra). It is the creative power (kriyasakthi). It is said to have seven notes (seven visible color bands). It is Pusha (the Heat). It is the cause of Lakshmi (the materials of the dirac-fermi field). It is the Garhapatya fire or the fire that cooks and nourishes beings. The dirac-fermi field that produces Quarks, electrons and neutrinos is called ‘Bhava’ Rudra or ‘Tryambaka’. Bhava means coming into existence. The Universe comes into existence with Bhava Rudra or Dirac-fermi field that produces these quarks, electrons and neutrinos. But this Bhava Rudra (dirac-fermi field) is brought to life by sadyojAta (Electromagnetic field). It is sadyojAta, the electromagnetic field, when it interacts with dirac-fermi field that produces charged particles. These charged particles are the basis of evolution of matter and beings. The bhava Rudra when it interacts with Electromagnetic field and keeps bringing up existence after existence. When it does so, it is called ‘Bhava-Udbhava’ (bhavodbhava) as it keeps bringing existence after existence, evolving the existence, continuously. Surrender to the just born force-field. Salutations to the just born force -field. Existence (birth) after existence (birth) not very much (na ati) existence (bhave) exists in itself (bhava-sva), I salute this who causes the evolution of this existence (bhava-udbhava). We salute the Electromagnetic force-field, which causes the evolution of Bhava Rudra and makes it bhavod-bhava Rudra. Most translations translate ‘Kim Adhau jAtam iti’ as which was born at first. But that is not what pippalada is asking. He is asking ‘kim Adhau ki jAtam iti’. Which was born below all..? Sadyo-jAta, the just born Electromagnetic field is born below all. It was born actually the last of all the force-fields.